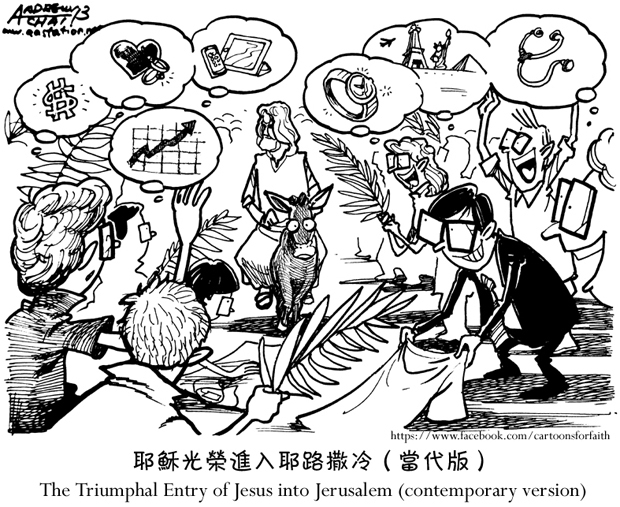 » 耶穌光榮進入耶路撒冷。The Triumphal Entry of Jesus into Jerusalem. 四福音只有馬太提到驢和驢駒，由於耶穌所騎的驢駒是從來沒有人騎過的（可十一2），因此需要母驢陪伴在身邊來使牠鎮定，這是當時常見的做法。參Beale & Carson, A Commentary of the New Testament Use of the Old Testament, (Grand Rapids, Mich.: Baker Academic, 2007), p.64-65. 關於我們 | 聯繫我們 | 廣告發佈 | 聯繫編輯 | 投稿 Copyright © 2019 Gospelherald.com.hk All Rights Reserved.